Why be concerned with the probability that a compact meeting of ELSs would happen by chance? "What you found is likely to have been found if monkeys typed the text. Therefore, if you find such a meeting, there is no great delight in sharing with others because people will say that ′I also could find that one in a monkey text.′ "
So if a meeting is put there deliberately by the author of the text, then the author would certainly not put it there as a meeting that has a chance explanation precisely because in that case we could not distinguish between one put there deliberately and one that occurs by chance. On the other hand, the meetings that have a very small probability of happening by chance are not likely to be found in a monkey text. And we shall see that this makes it more likely that a monkey did not type the text. Calculating probabilities associated with Torah code experiments can be difficult and messy. Some observe what they believe to be a meaningful pattern in some ELSs and wonder in amazement that it happens at all. They think the probability that such a pattern would happen by chance is infinitessimally small. More often than not their intuition is wrong. Others attempt an analytic probability calculation, and do it wrong. There are some presentations of patterns of related ELSs which are thought to be interesting. The people who present them often exclaim, expicitly or by implicit inference, that the probability of this happening by chance is small. There are also some who attempt to analytically calculate the probability of a complex pattern. Here we show that the exclamations of small probabilities and the calculations of small probabilities are easily glaringly wrong. We begin with an ELS pattern relating to the Rambam. Here is a description about how a simple probability can be calculated and how the simple probability calculation is in fact not relevant; it is in fact meaningless. When the probability question is framed so that description of the interesting pattern is beginning to be demonstrably a priori, so that the probability will be meaningful, the calculation shows that the pattern is expected; it is nothing unusual. Next we look at one of the patterns discussed by Novick who notices that the year 5755 appears some unexpectedingly (for him) large number of times in chapter 34 of Exodus. We examine his statement and the pattern and show that it is indeed expected. Nothing unusual is going on. 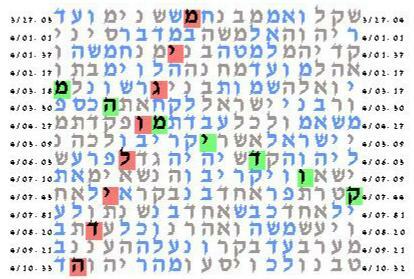 Next we look at some of the patterns discussed by Rambsel who uses patterns he found of ELSs to prove that Yeshuah is encoded in special ways in the Torah. He rhetorically asks who can calculate the probability? Implying that the probability is very small. We do the calculation and show that the pattern he found is nothing unusual. There are some that attempt the probability calculation analytically. A correct analytic calculation is difficult and often messy and most do not know how to do it. The simple analytic calculations made in some Bible code programs sold commercially are glaringly wrong and can be off by an order or more of magnitude. In general, the only safe way to compute a probability in Torah code experiments is by a Monte Carlo simulation. The following article provides a technical discussion of why the analytic calculation described by Reinhold and done in the codefinder program is wrong. Analytic probabiilty calculation is 262.964 times smaller than Monte Carlo probability!